EEBA for iPhone, Better than Ever! 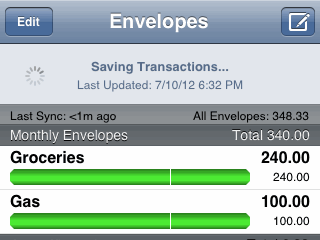 Building off that momentum, we’re bringing more features and more functionality to the iPhone app, making it even better! You can get it here or learn more about what we’ve been working on below. 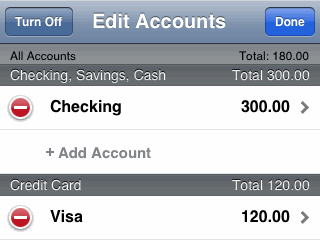 Add Checking or Credit Card Accounts right from your phone. All the power of Accounts on the web, now on your iPhone! EEBA syncs faster, smarter, and more reliably with this new release. Pull down on your screen and watch it fly! 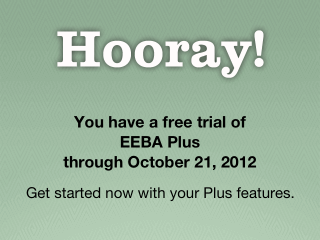 Haven’t checkout out a paid plan with EEBA yet? Now you can start a subscription right from your iPhone. Ready to update EEBA for your phone? Head over to the App Store to download the latest version of EEBA for your iPhone. Deep thanks to our community for their suggestions and bug reports. You make all this possible, thank you! Poor we Windows phone owners. When can we expect eeba for Windows? Hi Anson, no word on that yet, but you can always use the EEBA mobile website in the meantime. Good luck! Please, please, please write a wp8 app. I miss eeba dearly…. Thanks for the feedback! Using the mobile EEBA website is still the best bet for Windows Phone users. I know this thread is 2 years old, but I love GB and am switching to a Windows phone soon. Will I be able to use this app with Nokia Lumia 925? Hi Nora – I’m glad you’re enjoying Goodbudget! Currently, we don’t have plans to support Windows phones – you won’t be able to use the app directly on your phone. However, you can always use Goodbudget by logging in through your phone’s web browser. I hope this helps!